Gillingham (Brimstone Press), 2014, xlvi + 140 pp. The lyric verse of FYODOR TYUTCHEV (1803 – 1873), one of the treasures of Russian literature, remains largely unknown in the English-speaking world. This generous new selection of 100 of his poems, in verse translations by John Dewey, offers a rewarding insight into the work of a great poet. 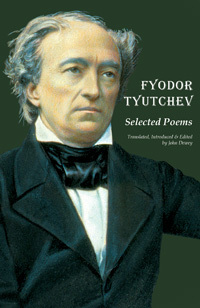 The translations are supplemented by an Introduction providing an informative survey of Tyutchev’s life and poetry, and by detailed endnotes on the individual poems. JOHN DEWEY's translations of Russian prose fiction include The Nomadic Soul and Day of the Angel, both by the contemporary writer Irina Muravyova, The Old Arbat, Boris Yampolsky's chilling novel of everyday life in Stalin's Russia, and The Sign, a collection of stories by Yevgeny Zamyatin. Among his publications in the field of Russian poetry are a verse translation of Pushkin's narrative poem The Bronze Horseman (shortlisted for the John Dryden Prize), and Mirror of the Soul, his critically acclaimed biography of Tyutchev. Selected Poems is no longer in print, but may be downloaded free of charge as an e-book here.